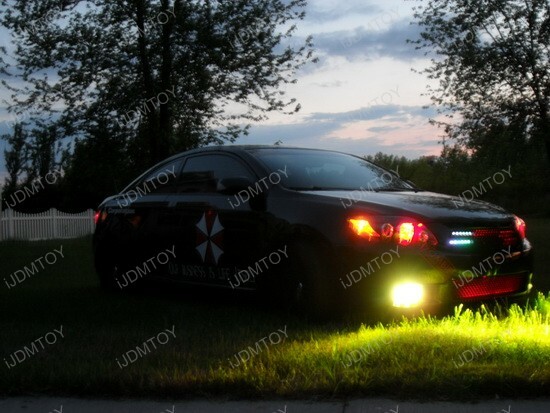 You’ll love this 2009 Scion tC Umbrella Zombie Response Vehicle with the featured incredible LED Scanner Lights. Project Alice’s mission is to answer the call for the zombie apocalypse and send Umbrella troops into the front lines. iJDMTOY’s Knight Rider LED kit perfectly fits for this project show car and if you see this vehicle rolling, it will definitely turn your head around. 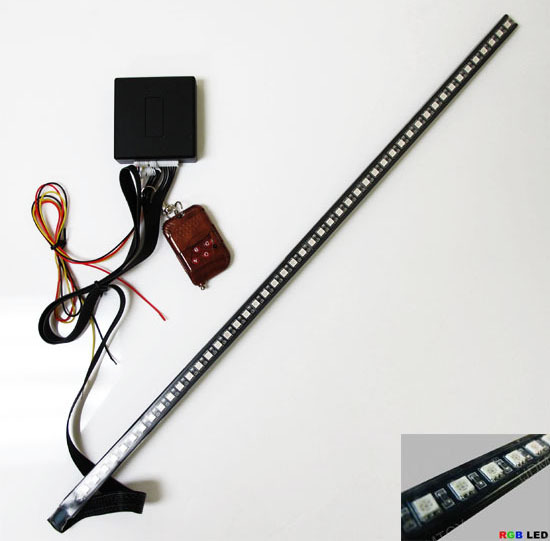 The LED scanner kit consists of 4 pcs 7" (about 19 cm) waterproof bars with 12 individual RGB Type SMD LEDs per bar. The Control Module is programmed with 55 Distinct Flash Patterns, which are enough to satisfy every taste. And what’s more, you get a remote control with a range up to 60 ft to switch this product on/off, change through the several colors, or flashing patterns instantly. Installing this fancy add-on is very easy. Position the LED scanner bar so the wiring side is close to the car battery, mount the strips to the front grille with zip-ties, tap the back and red wires from the controller to battery positive and negative and that’s it. Please do not bend the end wiring portion of the bars in order to keep them working. Test if everything works and if you like jokes, you can always drive after some friend of yours, switch on the LED Scanner Lights and freak him out. 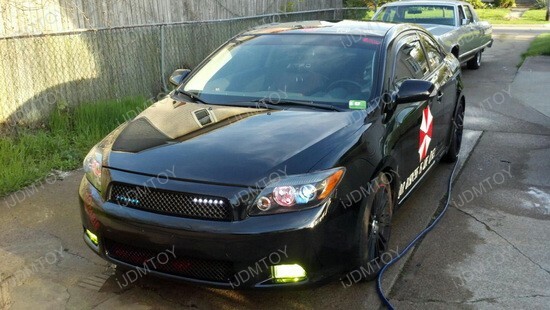 This 2009 Scion tC with Knight Rider LED lights is a really fancy show car, that gets people’s attention. 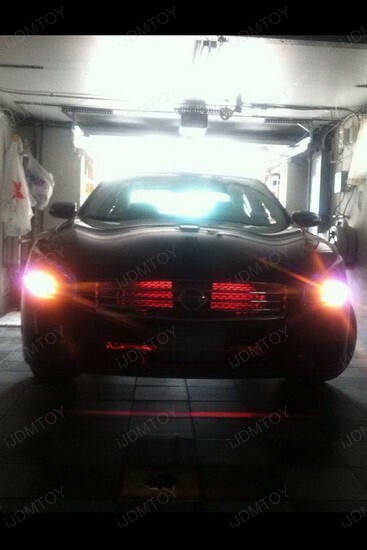 You can also get your car noticed with iJDMTOY’s new LED Scanner Lights kit and add some color. This add-on is universal fit product and will work for both car interior or exterior. Don’t waste your time, join the many happy iJDMTOY customers and get your car a new, badass cool look now! This is a crazy 2011 Nissan Maxima with very cool LED Scanner Light behind the grill. And if Nissan calls the Maxima "The 4-Door Sports Car. ", I call this one a "head-turner car". Check out the curvy sheetmetal, the aggressive front-end design, add LED Knight Rider Light and what you get is a real show car. Just like the BMW Vision from the latest Mission Impossible – Ghost Protocol motion picture. Well, the fancy glowing LED’s in the grill aren’t just the thing for a spy trying to keep on the downlow, but the appearance of the car is very eye-catching. However, the owner of this baby is extremely happy with his purchase and here’s what he said: "These lights are sick! 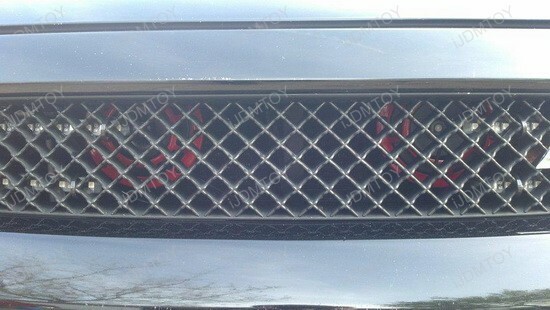 I put them behind my Nissan Maxima grill and they make my car look evil!" I will add "The 2011 Nissan Maxima sure earned and stayed true to its name, but this is a great opportunity to add a touch of personal and fancy LED style to the tremendous list of standard features and available tech features." What you get is a bright, very visible, easy to install universal fit 48 RGB 7-Color LED Scanner Strip, capable of flashing light in 130 distinct patterns. 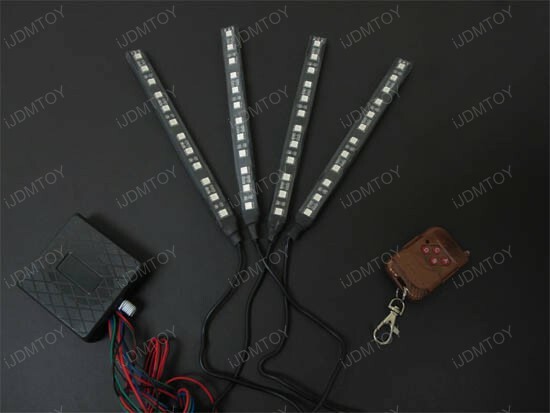 The kit includes 1 piece 24 inches (60cm) long super bright 48 RGB type SMD LED waterproof LED strip light; 1 piece Control Module; and 1 piece Remote Control (60ft range). The DIY installation of this awesome product is very simple. All you have to do is tap the wires to the DRL and voila – it works like a charm. Keep in mind that red and black are the typical positive and negative, the yellow is optional for the brake light and the two green are for the left and right signals. Use the remote control to turn it on/off or change color and pattern. In case you have any questions, don’t hesitate to contact iJDMTOY. 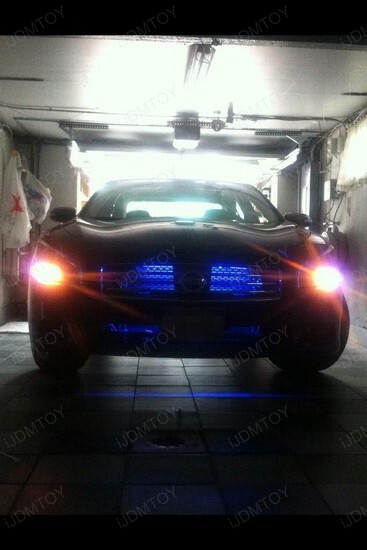 This guy took his 2011 Nissan Maxima to the next level with the LED Scanner Light and this is definitely a chance to fresh up the look of your ride, too. Don’t waste your time and get your car a new, badass cool look now! 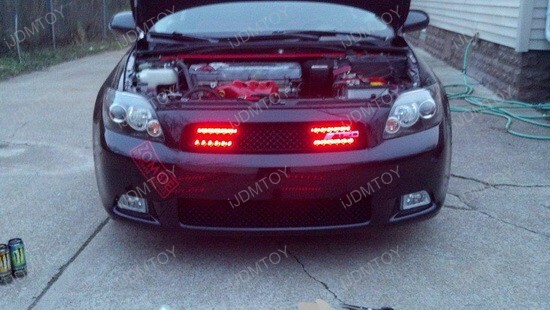 Introducing iJDMTOY’s new products for halo projector headlights and LED tail lights.